Dröne's Drone is a worthwhile experience. It's certainly true that finding a good, evocative name, agreeable to everyone, is perhaps the hardest exercise when setting up a new project. So, instead of racking your brain needlessly, you could just call your band Dröne, especially if you are in fact playing Drone. It's clear enough to let everybody know what one is dealing with! And luckily, the moniker Dröne sounds way better than...I don't know... Bläck Metäl, for instance. I’ve been pleasantly surprised by the first track; even if the saturation clearly lacks feedback - which turns out to be a smart choice actually - you’re quickly transported by the incantatory vocals in an oriental bad trip, floating on - and almost drowning in - a thick smoke while what sounds as a kind of occult muezzin is calling to prayer. But, everything stays blurry and you really don't feel at ease at all; the burning sun, so heavy, increases your nausea, and it makes you sweat more and more. Just wait till you faint, and then let your eardrums drone on a little longer. 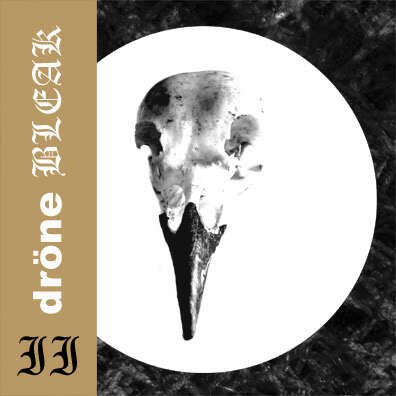 Unfortunately, tracks number two and three are not as interesting, as they follow well trodden Drone paths; still, the overall quality remains fairly good, but I hardly see me picking up this album in the future just for the sake of these very tracks. The guitars are massive and speakers-trying - no problem with that - but so they are in many other Drone tracks, and this can’t surely help the band stand out in any way. That said, the fourth and last song catches my interest a bit more: 35 long minutes of crushing and disturbing crackling low-waves which make you worry about your poor hi-fi system's health; 35 long minutes of being trapped in a dark, filthy, cold and damp basement where you can hardly breath without risking pulmonary edema. In another context, this song would have been a Khanate instrumental. All in all, an experience worth trying.